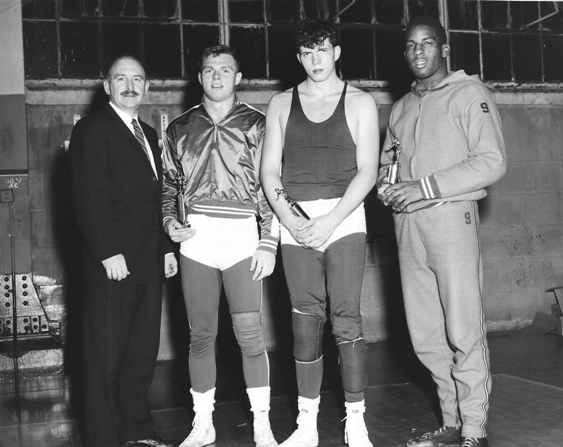 (2nd from left) - Fred Lehman 177lbs. from York Junior College. 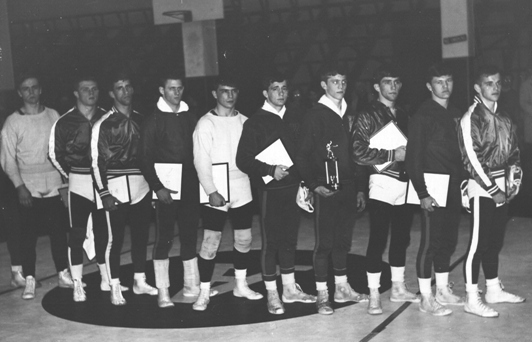 (3rd from left) - Gary Longenecker 167lbs. from York Junior College. (1st from right) - Fred Bankert 113lbs. from York Junior College. and Gary Longenecker @ Manheim Central HS. ▪ York Junior College placed 2nd in the team standings w/three champions. 3rd place finisher Jerry Buchman (Nassau Community College). Spring Grove HS and Lehman wrestled for West York High School. York Dispatch - York Junior College vs. Keystone JC - 1967. Keystone's Jerry Shearer in YJC's 19-11 win over Keystone. Gary Longenecker & Steve Redding. Fred Bankert had a draw. *Jeff Linebaugh, & Bobbie Terrill. & UMD wrestling manager... Lonnie Rutledge. *West York HS Grads - *Jeff Linebaugh (1967) & *Fred Lehman (1966). **Gobel Kline - 1969 NCAA Division I Wrestling Champion - CLICK HERE! Dave Carley, Fred Callahan, Steve Smith. ▪ York High's Tom Muldrow dec. West York's Fred Lehman 6-4. WY's Linebaugh &... Emenheiser claim '66 YCIAA Crowns!